America New York Ri Wang Food Group Co. has issued a recall for several of its seafood products due to undeclared milk, which could lead to life-threatening allergic reactions in certain consumers. The Canadian Food Inspection Agency (CFIA) initally spotted the issue and reported it to the company, which immediately issued a voluntary recall. 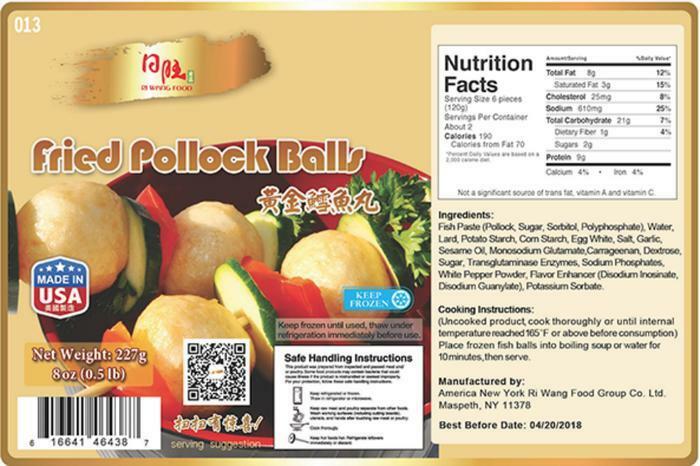 The list of affected America New York Ri Wang products include all lot numbers of Fish Balls, Fried Pollock Balls, White Fish Balls, Pollock Fish Balls, Cuttlefish Balls, Imitation Lobster Balls, Fish Tofu, Fried Fish Tofu, Fish Tofu with Shrimp Filling, Fish Tofu with Shrimp, and Fish Balls with Custard and Fish Roe. The products were sold frozen in New York, New Jersey, Massachusetts, Rhode Island, Pennsylvania, Maryland, and Illinois, but no illnesses have been reported to date in connection to the problem. Consumers who have purchased any of the above products are urged to return them to the manufacturer for a refund. For more information, consumers can contact the company at 1-718-628-8999, Monday through Friday, from 9 a.m. to 5 p.m. EST.